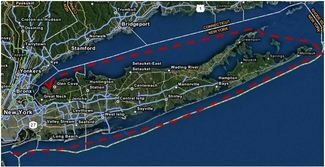 August 5, 2014 -- Under a starless, moonless Friday night sky, and nearly 28 hours after setting sail, the 40 foot Leverage and its crew of seven, having just overtaken the imposing 56 foot catamaran Rainmaker with only a few hundred yards to go, crossed the finish line first at the Glen Cove break water in the 38th annual Around Long Island Regatta. Over the next 20 hours, another 57 of the 64 sailboats that had assembled in the Atlantic Ocean early Thursday evening about four and a half miles off Breezy Point, Queens would enter Hempstead harbor completing a 190 nautical mile race that has been organized and hosted by the Sea Cliff Yacht Club since the event's inception in 1977. Competitors faced a diversity of maritime conditions that required crews to demonstrate their skill in both ocean and coastal racing as they set off eastward from the Rockaways to Montauk Point, and then, after turning northwest through Gardiner's Bay and the treacherous tides and winds of Plum Gut, entered Long Island Sound where they sailed west towards Sea Cliff. Many of the boats, this year varying in size from 21 to over 50 feet in length, carried crews of eight or more, while doublehanders sailed only a skipper and mate, with competitors on all boats sleeping in shifts over the one to two day journey. The annual race has not only been open to vessels of varying sizes, but also to sailors of all ages and levels - from teens in the junior division just getting their sea legs on larger boats and yachtsmen more accustomed to weekend cruising, to old salts with decades of racing experience and blue water competitors seeking to earn points for the Northern Ocean Racing Trophy. Some have participated in the race since the 1980s, while others are first-timers. Arthur Rich, of Peekskill New York, who skippered the 37 foot Baltic Letting Go, has completed the race 31 times. This was the first ALIR for Doug Reynolds, 24, of Great Neck, a student at Oakcliff Sailing of Oyster Bay. Hardly a novice however, having sailed since age six and in the Newport to Bermuda Race earlier this summer, this week he skippered a Farr-40 for the first time, and along with his crew earned the Spinnaker Division 8 first place trophy. Clearly buoyed by the experience, Mr.Reynolds said, "It wasn't only skippering in a race and on a boat of this level and working together as a team, but also the preparation of the boat from scratch that is so rewarding." Usually, depending on wind conditions, the fastest vessels can be expected to be within view of the Sea Cliff Yacht Club about 24 hours after the start, with the final finishers arriving perhaps a couple of days later – although, there have been races, explained Regatta Committee Chairperson Effie Marie Smith, when boats have reached the finish line as late as Tuesday. The course record is 15 hours 34 minutes. In this year's race, the last of the 57 boats completing the course crossed the Glen Cove breakwater at 8:30 pm on Saturday - 50 hours, 30 minutes after setting sail from Breezy Point. However, with the PHRF handicapping system in place that "corrects" sailing times, the playing field is leveled so that competitors on structurally faster boats do not have an unfair advantage over those on vessels with a less sophisticated design, allowing strategy, tactics, skill, and good fortune to determine the winners. And so, overall, the doublehander Weegie, skippered by Richard Fleischman of Setauket, although crossing the finish line 45 minutes after Leverage, had the lowest corrected time of the Regatta - 26 hours, 59 minutes and 12 seconds. Organizing the Regatta, just as sailing boats at this level, is truly a team effort, requiring, from stem to stern, a considerable amount of time and dedication from dozens of volunteers. "It's a year long process," Ms. Smith explained, and in two weeks the Regatta Committee will already be formally beginning preparations for the 2015 Race, as it starts to line up sponsors and make other arrangements. In addition to the Regatta Committee's efforts, other club members help out at the Regatta desk on the racing days taking calls from crews when they round Montauk Point, and a second time when they reach Oyster Bay, as well as entering race times into computers, while still others, in four hour shifts throughout the day and night, assist in manning the "committee boat" at the finish line, calling in times, marking the arrival of the first finisher of each division with a shotgun blast (blanks of course), and greeting all other competitors with the squeal of an air horn canister. This year, as in the past, the United States Naval Academy had two boats competing, Dolphin and Ranger, and in a salute to their service, several yacht club families hosted and quartered the midshipmen and their coaches in their homes while on land, and earlier in the week, the club hosted a pig roast dinner party in their honor. Additionally, the Sheepshead Bay Yacht Club has contributed to the effort each year, allowing competitors to use its moorings, and by hosting a skipper's meeting the evening before the race. The Regatta concluded with a party on Sunday afternoon. And while the awards ceremony recognizing the top finishers culminated the day, the event was more of a celebration of the fruition of many months of preparation, hard work, collaboration and perseverance on the part of both the hundreds of competitors as well as the race's organizers. In addition to Ms. Smith, this year's Regatta Committee included PC Doug Wefer, VC Jim Arnemann, Gov. Jim Aikman, Maureen Raftery, PC John Dawson, Commodore Harvey Bass, PC Jim Carballal, PC Tim O'Rourke, Maggie Feinsilver, Chairperson Effie Marie Smith, Wayne Smith, Frederick Fuchs, Fred Yutkowitz, GM Charlie Walsh, Tres. Marc Mandel, PC Dana Schnipper, RC Brad Dickson, Dockmaster Frank Banks, Club Council Don Kavanaugh, PC George Christman, and Steve Feinsilver.